A group of community leaders, conservationists, outdoor recreation advocates and historians is looking at ways to preserve Crowell Hilaka, the 336-acre former Girl Scout camp in Richfield Township. 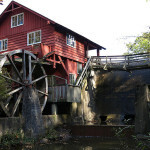 The property is known for its extraordinary natural resources and historic landmarks. A fall open house sparked new interest in preserving the property and prompted an increase in philanthropic pledges to the Friends of Crowell Hilaka, a group trying to save the former camp. In addition, the owner of the property, the Girl Scouts of North East Ohio, has entered into a contingent purchase agreement with the nonprofit Western Reserve Land Conservancy, which has convened a coalition of community advocates in its continuing search for a purchaser aligned with its preservation mission. 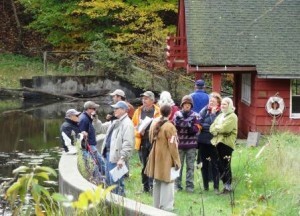 In addition to the Friends group, the Land Conservancy and GSNEO, others involved in the informal talks have included representatives from Richfield Township, the Village of Richfield, Summit County Council, the Richfield Historical Society and the Buckeye Trail Association, as well as township and village residents. Leslie said the Land Conservancy now has until November to finalize the acquisition. The property is the former estate of inventor James B. Kirby, who sold the land to the Cleveland Girl Scouts in 1937. For more than 70 years, thousands of girls camped at Crowell Hilaka, and the historic Kirby’s Mill became the iconic symbol of the Cleveland Girl Scout Council, which was later folded into the 18-county GSNEO. Crowell Hilaka was one of several camps put up for sale in 2012. The Friends organization – originally made up of Girl Scout alumni familiar with the camp but now a diverse group that includes historians, civic boosters, outdoor enthusiasts, advertising executives, artists and others – has been instrumental in the effort to preserve Crowell Hilaka. In an effort to strengthen its message, the group recently unveiled a new tag line, “Preserve Ohio’s Hidden Treasure,” and a new logo, a streamline silhouette of Kirby’s Mill. 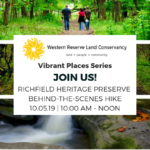 Join us for a behind-the-scenes tour of the Richfield Heritage Preserve!